Behind an unremarkable door of an unremarkable terraced house in a quiet corner of Cambridge hides an artistic treasure. Known as the David Parr House, this modest residence holds an exceptional painted interior. Its walls and ceilings are decorated with beautifully patterned designs that would not be out of place in a Victorian church or an Arts & Crafts home. 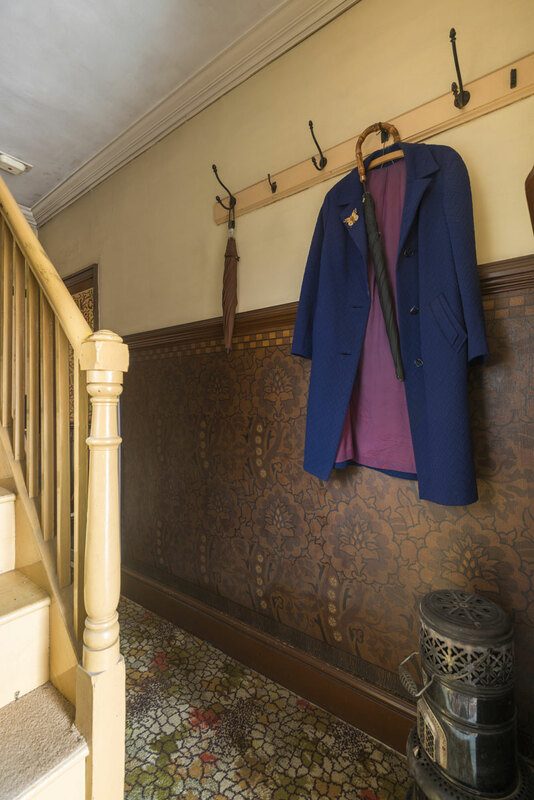 Until recently, the house was known to few other than the family that lived there, but a project is now underway to uncover the secrets of this extraordinary place. In contrast to most of Cambridge’s rich heritage, the David Parr House has no direct connection with the university. The paintings here are not the products of an elite education, but the creations of a working man. His story offers a different perspective on Cambridge life to the one we usually hear. David Parr was was a craftsman-painter employed by the Cambridge firm, F.R. Leach & Sons, one of the leading providers of church decoration in Victorian England. Established in 1862 by Frederick Leach, the company specialised in carrying out decorative schemes for neo-Gothic churches, working with the foremost architects and designers of the Gothic Revival, including William Morris, George Bodley and Charles Kempe. Leach’s company undertook commissions across England, but some of its finest work can be found in Cambridge, including the highly decorated interior of All Saints’, Jesus Lane (1864–79), Jesus College Chapel ceiling (1866–69), and the roof and walls of Queen’s College Old Hall (1872–75). F.R. Leach & Sons employed craftsmen skilled in stained glass, stone carving and mural painting, the latter being David Parr’s specialism. Parr clearly prospered in this line of work and in 1887 could afford to buy a modest home in the Mill Road area of Cambridge. At the time, this was a working-class district populated by tradesmen and employees in local industries and on the railways. In the course of the next 40 years, Parr devoted a large part of his leisure time to embellishing the walls and ceilings of his home with designs inspired by the decorative schemes of churches and the large houses he worked on in his day job. He carefully documented all of his home improvements in a notebook, which still survives to provide a valuable record of his labours. His most bravura designs are in the sitting room. Here he painted a complex pattern of interweaving foliage and flowers above the dado-rail, with simpler tree motifs below. The colour scheme skilfully balances light and dark greens against a pale pink background and brick-red borders, embellished in places with gold detailing. This is an Arts & Crafts aesthetic, but given an ecclesiastical touch, with ornamental scrolls that run horizontally across the walls, bearing quotations in gothic script. In the back room his design is airier and more stylised, alternating red and green leaf shapes that weave up the walls in a lively interplay of repetition and variation. More wall paintings in similar styles can be found in the hall and bedrooms. Parr created these paintings not with stencils, but using the more traditional method of pouncing. This technique involves replicating each element of the pattern by forcing chalk or charcoal through holes pricked in an outline drawn on paper and then painting the colours in by hand. It was a laborious process, but one that produced a crafted rather than processed effect. Parr lived in the house until his death in 1927. 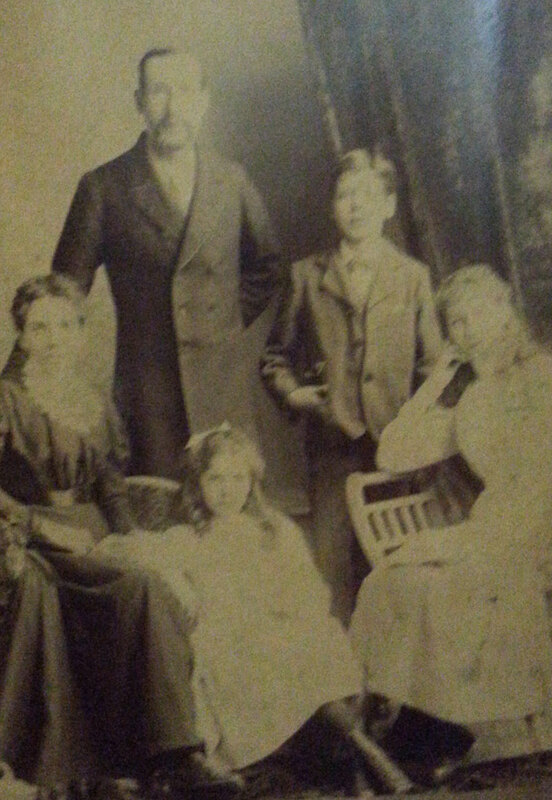 His granddaughter then inherited it, married and raised a family there. Mrs Palmer, as she was known to neighbours, lived in the house until 2013, and died the following year. It is thanks to her long residency and her wish to preserve her grandfather’s legacy that his decorations have survived. 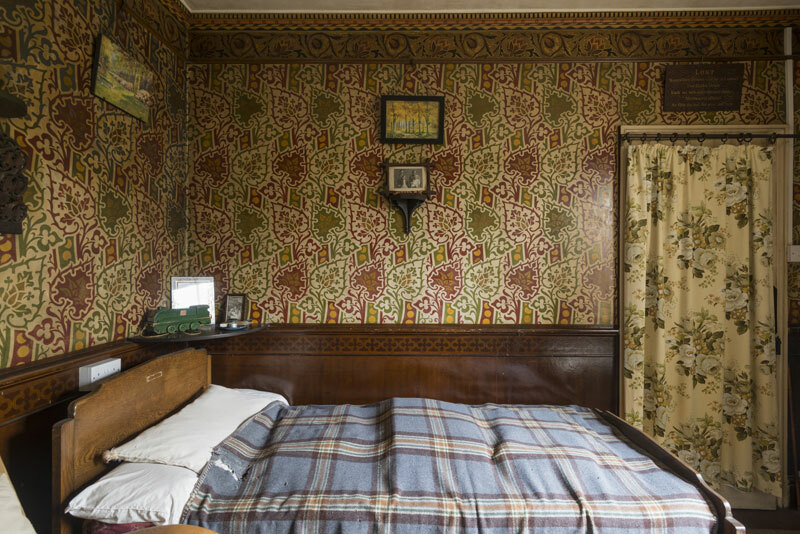 The David Parr House is now owned by an independent trust that is busily raising funds to conserve, research and make publicly accessible this unusual home. This presents many challenges, not least how to retain the mood of quiet domesticity and privacy that pervades the house. Despite the survival of David Parr’s notebooks, we know very little about what motivated him to beautify his home in this way. The lines of verse inscribed on the sitting-room wall suggest a moral purpose, towards a life lived modestly and deliberately: ‘Seize the moments as they fly, know to live and learn to die’ reads one quotation. It is tempting also to see the ideas of William Morris at work here, a democratisation of beauty. Art, Morris believed, was ‘the expression of man’s joy in labour’. There can be few places that attest this principle more persuasively than the David Parr House. The David Parr House can be visited by booking a private tour. Thank you for opening to readers the unexpected interiors of this beautiful building.